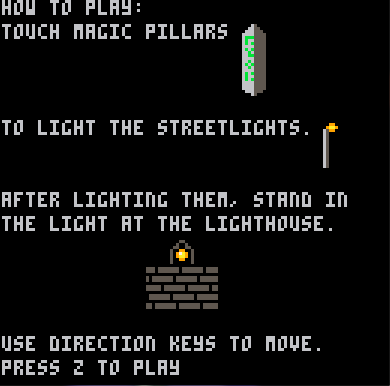 - Enemies will spawn in after lighting a few streetlights, so do your best to avoid them, as one touch will kill you. - A pillar is only good to touch if green runes adorn its entire surface and it's only three blocks tall. Other pillars are there to distract you. - Fog will come into the game after the first minute, obscuring the screen and making your journey more difficult. The fog will grow worse the farther into the game you get. - You can walk behind pillars, trees, etc. Only their bases can obstruct your (or an enemy's) movement. Good stuff. Really quite effectively creepy for such a simple game. I think the music does it and the sort of abstract tone. Liking the blood splattered white trees. I liked the baddies. I couldn't work out what they were, which actually lent to their creepiness even more. Thanks :D That's what I was going for.